RummyCircle Mobile has been launched for all Android and iOS devices all over the world. If you have an iPhone or iPad which runs on iOS7 or higher open the app now in your Safari or Chrome browser and enjoy unlimited Deals Rummy game. Android users can start enjoying the game by opening the RummyCircle website on your smartphone or tablet running on Jelly Bean and above. The game will only work on Google Chrome version 28 and above and Opera 12.1 and above browsers. 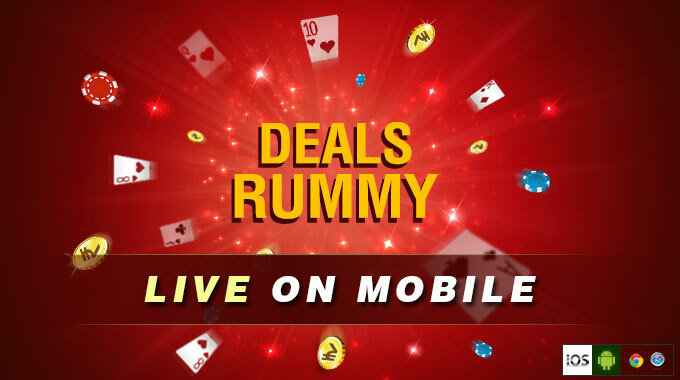 So, it’s your time to play online rummy tournaments on your mobile on the go! Open the RummyCircle website on your mobile browser, login with your credentials and start playing online rummy! You already know all the basic advantages of playing on mobile. Some of the best advantages of playing RummyCircle Mobile is you can play anytime, anywhere. You don’t require to waste extra space on your mobile by downloading the rummy app, instead just visit m(dot)rummycircle(dot)com on your iOS or Android smartphone or tablet for instant access to your favorite rummy game. Also make a deposit via your RummyCircle mobile and get 100% bonus up to Rs.1000 bonus. This offer is only applicable on your deposits via mobile. The RummyCircle Mobile is supported by both Safari and Chrome. You can have a good game of Deals Rummy on Safari version 7 and above and Chrome browser version 31 and above. The game will run on Android OS 4.1 and above along with iOS 7 and above. Most of the current smartphones and tablets can run the RummyCircle Mobile without any trouble. You can not only play Deals Rummy with this mobile version of Rummy Circle but also can try your hands on 13 Card Pool Rummy, 13 Card Point Rummy and also Multi Table Tournaments. Got any queries or feedback on RummyCircle Mobile? Leave your comments in the comment section below.